Doughnuts are another thing on the list of "things I only recently realised are very easy to make at home". This list also includes ice cream, almond milk, mozzarella cheese, and a whole heap of other things. Recently Richard's parents were visiting, and we took them to Chelsea Market in NYC. It has to be one of my favourite places in New York, aside from the green market. There are so many amazing things all jammed into one building and its just the best! We got some teeny baby doughnuts from The Doughnuttery, and one of the flavours was called "Paris Time" - Vanilla, pistachio and lavender. If you know me you know that anything Lavender gets me all heart-eyes, and these were no exception. Of course as soon as we got home I had to recreate my own version.. so here we are! Brioche doughnuts bring a whole new element to the doughnut game - they are buttery and tender and just the right amount of sweet to hold up against being drowned in pistachio and lavender sugar. Normally I have a little bit of whatever I make then give it to friends, our staff at the studio, the doormen, etc (If you live in NYC and like baking hit me up because theres always extra), but not these. My goodness. The combination of brioche, pistachio and lavender is one of my favourites. If you are planning on making these, you will need to make the dough the night before and give it its first rise at room temperature, and then the second in the fridge overnight, then shape the doughnuts and give them their third proof the next day before frying and sugaring them. You could also use non brioche dough if you wanted these to be ready the same day you make them - Deb's recipe is my favourite. The dough recipe I have used here comes from the Bouchon bakery book, which is soon becoming one of my most reached for books. All the recipes are in grams, which I LOVE (My brain works in kilograms and grams, and I struggle so so hard to swap over to pounds and ounces), and the recipes are so well written and easy to follow. If you are looking for an amazing pastry book, this is my current fave! In the work bowl of a food processor, pulse the pistachios, lavender and 200g (1 cup) sugar until it resembles fine crumbs. Pour into a small bowl and add the remaining half cup (100g) sugar, and stir to combine. Set aside and store in an airtight container until ready to use. Place flour and yeast in the bowl of a stand mixer fitted with a dough hook, and stir to combine. Add Sugar, salt, milk, eggs and vanilla paste, and mix on low for 5 minutes until combined. The dough will look sticky. Mix for a further two minutes. At this stage some pieces of dough will be sticking to the sides of the bowl. Add the butter a cube at a time, mixing well until each piece is well incorporated. Scrape down the bowl and hook, and mix for a further 15-20 minutes, scraping down periodically. Turn the dough onto a well floured work surface. Avoid adding flour if necessary - add only enough to prevent sticking. Shape the dough into a rectangle, with the short side facing you. Fold the top side down toward you two-thirds of the way down the rectangle, stretching slightly, then repeat with the bottom side, stretching lightly again. Lightly oil a bowl. Place the dough, seam side down into the bowl. Cover with a cloth and leave at room temperature for about an hour. Re-flour your surface, and turn the dough out onto it. Press it into a rectangle and repeat the stretching and folding process. Re-oil the bowl, and return the dough to it seam-side down. 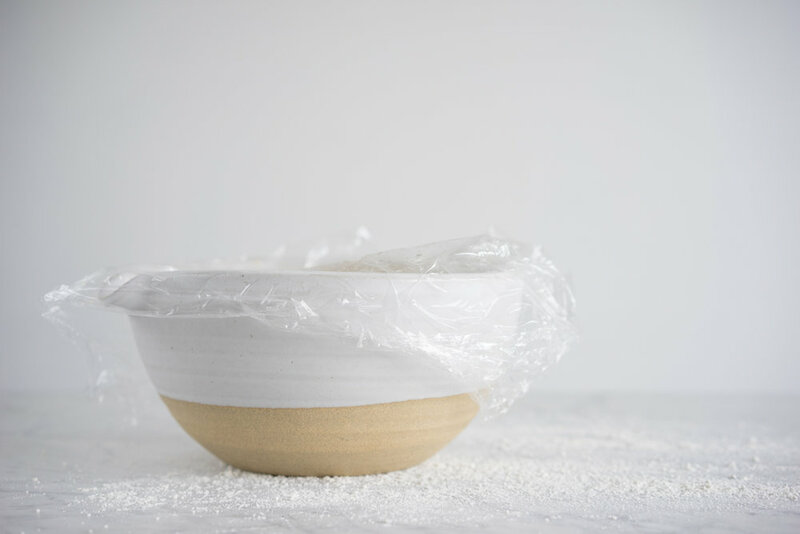 Cover the bowl with plastic wrap and refrigerate overnight. The next day, lightly flour your work surface, and turn out the dough. Roll it into a round about 12 inches in diameter. Place on a lined tray and refrigerate for 20 minutes, or freeze for 10 minutes, until the dough has firmed up enough to cut easily. Cover the doughnuts with plastic wrap sprayed with cooking spray, and leave in a warm place for 1 to 1 1/2 hours until doubled in size. Place approximately 3 inches of oil into a deep pot or dutch oven, and heat to 350f/177c. Place a cooling rack over a sheet pan, and have the pistachio lavender sugar on a plate nearby. Working in batches of two, carefully lower the doughnuts one at a time into the oil. Fry for 1 minute, then flip and fry for an additional 2 minutes, until golden brown. Remove from the oil and place on the rack. When the second batch has finished cooking, transfer the first cooled doughnuts into the bowl of sugar and generously cover both sides with sugar. Tap lightly to remove excess sugar. Repeat frying and sugaring process with the remaining doughnuts. Doughnuts will keep for one to two days in an airtight container, but are best eaten on the day that they are fried.